The intention of this article is to educate and update on mining investment and the precious & base metals before we finally start the second half of 2007. Conditions have been strong in the ASX mining sector over the part few weeks which indicates very interesting events directly ahead. Gold & silver have been pretty boring the last few weeks as they range sideways – as expected. The base metals are consolidating and nickel got flushed out nicely, now looks like a clean market according to Colin Emery who is our GoldOz Newsletter contributor. Firstly some fun with investment criteria for making profits from mining shares. The buttons that get investor interest can be reviewed for more experienced market players and summarized for new and less experienced investors as a group of “P” words - just like it is done in the “so called” secrets of property investment… Position, Position and Position. Except in mining share investment it is much more interesting. Now before you say that is Pretty Pathetic let me explain that some Particularly Perplexed Punters have Pleaded with me to Provide some Practical Pointers for Predicting the Perfect Price Parabola. Firstly you need a good general knowledge of the stocks on offer and a good sized short list to work with – then a measure of Patience and Persistence. Let me emphasize Management because if they are not Prudent they can get the company and your investment into trouble; look at the hedge disasters of yesteryear with hidden early trigger clauses, mining is tough and Management have to stay ahead of the game which takes a good team and experience. They must have Presence within the industry to inspire respect and gain institutional support and they must have Potential as viewed from this perspective. If they have Proficiently Produced operational mines in the past they will have a reputation for this. Next thing required is a good tenement address, the mining Province, yes there is that real estate term and it does relate to Position along strike from known reserves and mines. It helps greatly if the metal being sought is Popular at the time, a hot sector with momentum. Trading conditions are Paramount to your investing success. Giant economic deposits in the area are a big plus for gaining interest when results start to come in, especially if they belong to the company of course. Now the main ingredient that generates excitement may just be Promotion and it is a highly significant factor make no mistake however there has to be a good story to promote so you need Progress to attract the Punters. These two are really key buttons and the progress component can take many forms such as drilling progress, resource definition and step out resource expansion progress, new tenement prospects acquired, exciting new joint venture agreements, decision to proceed to a full feasibility study and progress towards a decision to develop a new mine. It can also be Progress towards increased Production or Production itself however this must be Profitable so high grade Prospects are Preferred. Investors want to see Profit Potential most of all so when all of the above P’s are combined you get a Precedent for magic investment conditions. Look… that is just a bit of fun really however there is much truth and novice investors can view a company report and see some high grade grab samples and assume this indicates Potential however it does not. Samples are selected carefully from the terrain during a ground survey and such rocks can be transported over great distances and even from other tenements nearby. A few Percussion drill results may also look good however the chances of the company finding an economic deposit are small and much of the “P” conditions above have to be “going” for the company for this to have much effect. So consider the Precision of the “P’s” when you are looking at fundamental causes as to why Prices Perform. OK now to a specific issue close to my heart and that is a small gold and nickel stock I selected as a perfect example of small cap potential. A bonus report was sent to my first thousand clients through the second half of last year and I have closely followed their progress from the 4.5c level. They hit 12.5c last week and I am delighted to say there appears to be further upside so investors who liked the story and decided to invest have done extremely well. Not bad during a gold consolidation – as I said; many of the ASX PM stocks Down Under are stupidly undervalued. The business of writing these reports and these articles too - is fraught with risk because you are writing about potential outcomes. You have to anticipate the future through careful analysis of the past and present (aren’t you glad I knocked off the capital P joke by now??). You stick your neck out to report on your findings as this is a public forum and it is a great pleasure to see investors profiting from your research - enough said. This is why I sell my research; so that these kinds of opportunities see the light of day for more investors. The ASX has been fertile ground for investors since I started writing publicly and the current conditions are strong even throughout the normal horror May - June period – they have been surprising so lets take a look at what has been happening. Conditions have been fantastic since the beginning of the year and this should continue over the coming months if my analysis remains correct. May I make the point that the most heavily promoted newsletters and advisors (big names Down Under) got it wrong for the first half of 2007 in Australia and I got it right – again very pleasing. I feel it has something to do with a fresh approach and that the game conditions have changed so the big names, although very bright guys - they got caught out this time. “Now last week I had the above chart in the box- of its recent consolidation and a little blue arrow and said – Its now broken out of this box after a good sideways correction ands that it was a break out to look for new highs and may pause but then will look retrend – this is what it did despite all the noise and panic elsewhere – it did a dip back but as you can see straight back up to the previous high this a.m. which it is testing and should keep searching the blue sky and new highs. As I said buy the break and buy dips….and the metals and miners index above chart shows you that despite the media’s best attempts to worry you thing when you stand back and have a good look are not that bad at all. Yep that’s right that I have said that now two weeks or more in a row…and it’s been dead right…and I’m still sticking to it – it’s a very clean break and although pullbacks will occur these should be bought – but here’s the chart…. Not much more I can say – the Miners and Minerals Index has broken up and out from the box and now the edges of the box 1 and 2 is a main support area and will be hard to be broken. A reversal pattern is circled and that’s also a support area – and note; the high support of that is line 3. Buy on supports and if we ever see it back in the box look to buy – exit if the bottom box line 1 is broken as can drop back to next major supports at lines 4 and 5. But we may not - this index can look for new highs for a while before consolidating or correcting. I have a first target of 4700 now – Note RSI is nearing overbought – so some profit taking can be expected. This may take the form of lower BHP and RIO prices as they are the big two in this index however we still have some beautiful opportunities covered in the current issue of the Newsletter bumper edition out today and tomorrow. The whole sector does not need correction only some stocks so there is ample opportunity here. 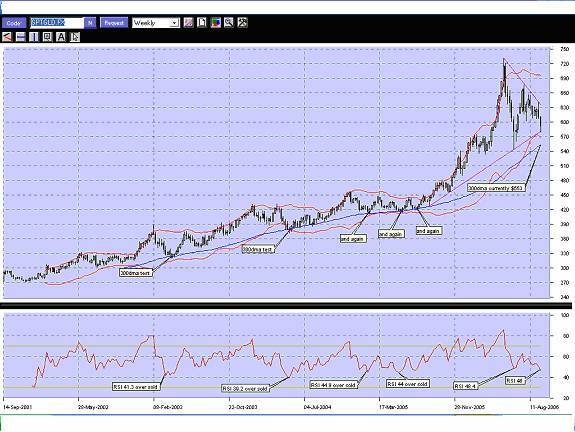 Gold neared its 300 day moving average once again last week, it now supports the gold price from US$640. It also touched the 40 week MA (200 day moving average) which has now turned up above the 60 week MA (300 day MA) The weekly RSI has just crossed over the 50 level and I am expecting a near term test of the US$690 level in the next 4-8 weeks, possibly the US$720 mark but don’t expect it to sail through this level without a fight. It looks like it has to test and correct a little and then retest before we really get underway. If we go below $620 for more than a couple of days we have to reassess this market. Silver – if $12.55 goes we could see a drop to the $11.65 support but resistance is at $13.55. Colin sums it up perfectly – this market has lost momentum and it would take news to change this so add slowly. Colin thinks in fairly short time frames and so this is short term – a few weeks may change this completely; we have to wait for a meaningful break. The rally is off if the $11.65 area is seriously breached for a few days – not an expected outcome. Copper is closing on a triangular apex at US$340, zinc is not far off supports and nickel has a newer more gentle upslope to follow now the spec funds have been removed – full details on all the base metals as always for subscribers. Things are getting back to normal at GoldOz as I have been away from the office for 4 weeks now – back into full action very soon. Last remaining discount positions for our GoldOz Weekly Newsletter are available through our new secure store and we take requests for ASX resource stocks if you want them covered by a leading specialist with elite level international experience. Knowledge is power – you can also get the PDF set for a broad range of 310 companies Down Under, get the data you need to make awesome investment decisions for the second half of 2007 – annual subscription is just AUD$99. Go to www.goldoz.com.au , new data on investment education is added as often as I can. Colin Emery is currently a Branch Manger and Senior Client Adviser of a Stock Broking Company in Queensland Australia. Prior to his work in Share broking he spent nearly 20 years in Senior Management and Trading positions in Treasuries for major International Banks such as Bank Of America, Banque Indosuez, Barclays Bank, Bank Of Tokyo and Deutsche Bank AG. He spent a number of years as a Senior trader in New York, London, Singapore, Tokyo and Hong Kong with these institutions. He also was Global Head of emerging energy, emission and commodity products for the leading Energy and Commodities brokerage firm of Prebon Yamane Ltd – Prebon Energy for four years before moving to Cairns in 2003 to focus on the Stock market and Private consulting work. The private consulting and advisory work currently undertaken is with companies involved in Resources, Energy and Renewable Energy and Forestry. Neil Charnock is not a registered investment advisor. He is a private investor who, in addition to his essay publication offerings, has now assembled a highly experienced panel to assist in the presentation of various research information services. The opinions and statements made in the above publication are the result of extensive research and are believed to be accurate and from reliable sources. The contents are my current opinion only, further more conditions may cause my opinions to change without notice. The insights herein published are made solely for international and educational purposes. The contents in this publication are not to be construed as solicitation or recommendation to be used for formulation of investment decisions in any type of market whatsoever. WARNING share market investment or speculation is a high risk activity. Investors enter such activity at their own risk and must conduct their own due diligence to research and verify all aspects of any investment decision, if necessary seeking competent professional assistance.